TRICK - I cut the peel off the eggplant and chop it finely, then add it to spaghetti bolognese or chili con carne. It gives a wonderful creamy texture and you can’t really taste or see the eggplant. The kids gladly eat it this way. Slice and salt the eggplant and leave for app 15 minutes. Then wash and dry with paper towel. Meanwhile fry the sliced onion 3-4 min and cut the dried eggplant in cubes. Add the eggplant, garlic, parsley, chicken broth to the pan and cook for app 10 min. Add garbanzo beans. Season with salt, peber, lemon zest and juice. Cook for 2 more min. Put the fresh spinach in a serving bowl and pour the eggplant mixture over. 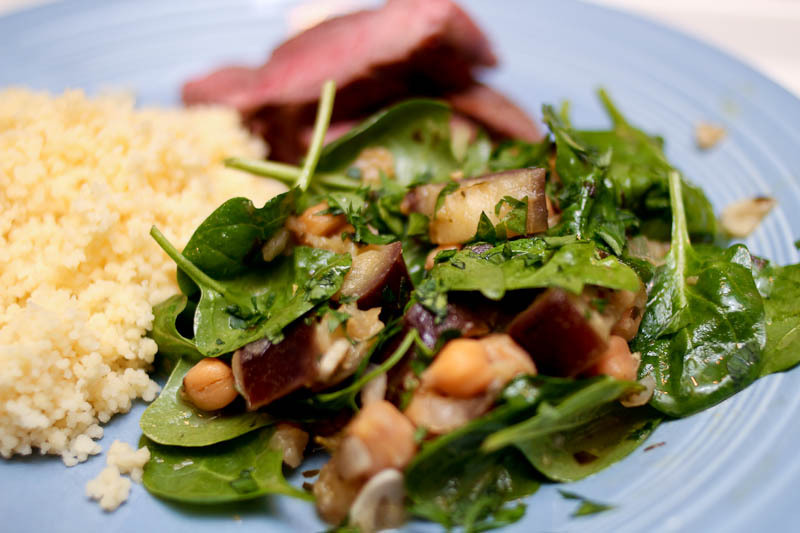 This entry was posted in Salads & sides and tagged dinner, eggplant, garbanzo beans, healthy food blog, recipes, side dish, spinach, spinatsalat, vegetarian. Bookmark the permalink. Eggplant is such an underrated vegetable. This looks super. Thank you. I totally agree. Eggplant deserves more attention. Billedet mangler på min PC når man åbner opskriften, men kom på den side, hvor jeg u sender kommentarer. Mon du kan bruge det til noget? Det er ikke sket før!